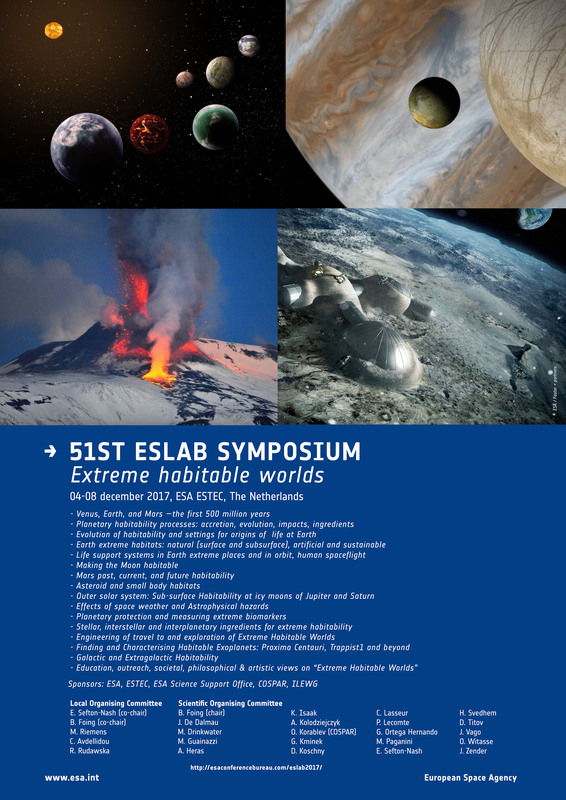 Microbial life could have been (or still be) present on a number of the worlds in the Solar System, in the past, today, and possibly in the future, as well as innumerable exoworlds. Will we find it in the Solar System, will we detect it on exoplanets? It all begins with our understanding of the origin of life. By life, we consider entities composed of carbon molecules and water, formed of the most common elements in the Universe. On Earth, a variety of environments, for example submarine hydrothermal vents, have been proposed for the emergence of life. In the Solar System, it is likely that similar environments existed on the local scale on Mars, especially early in its history and probably Venus. Some of the satellites may have had liquid water containing organic molecules, such as Enceladus, Titan, Europa, Callisto and possibly others. On Mars, for instance, early seas and crater lakes on a geothermally hotter planet, subject to volcanism and impacts, could have seen the emergence of life, at different places at different times, despite the lack of total ocean cover. Could it have developed on the icy satellites of the Solar System? They are all far from the Sun, whose luminescence was low at the early stages when liquid water could have been in contact with hot crust on the satellites. Moreover, if any incipient microbes existed, they would be concentrated close to the lithic sources of heat, nutrients and energy, not free floating in the upper realms of the water column where limited sunlight could reach. Microbes are the archetypal opportunists. This means that, from the microbial point of view, many places on Mars, for instance, could potentially have been inhabited since microbes can colonise even briefly habitable environments. Detection of traces of microbial life in the Solar System may be possible on Mars, especially if we can land in the sweet spot where there has been hydrothermal activity. Detection of traces of life on the icy crusts of the satellites is more challenging. Even if there is life on them and cells are extruded in the plumes from the underlying oceans, the extremely hostile radiation environments bathing the icy crusts make detection of organic molecules challenging. So, Mars is still the best choice in the Solar System where we have a likely chance of finding traces of life. Westall et al. 2017, Astrobiology, in press. Westall et al., 2015, Geology,43, 615. Could microbes live in Venus ? In its first 500 million years Venus started out with environmental conditions very similar to Earth, including the presence of an early ocean on its planetary surface. However, it is unclear how long the ocean remained stable on the Venusian surface. Some estimates indicate that liquid water was present on the Venusian surface for a billion years or longer. If so the origin of life on Earth’s twin planet seems reasonable. As the Sun increased in brightness and Venus increased in temperature through its thickening greenhouse gas atmosphere, the shift in climate could have probably been catastrophic to life resulting in the extinction of life on the planet, or microbial life could have retreated to one potential habitat still available: the lower cloud layer. Indeed, the clouds of Venus are much larger, more continuous, and stable than the clouds on Earth and conditions in the clouds at 50 km in altitude are relatively benign, with temperatures of 25 to 75°C, pressure of 100 kPa, and a pH of about 0. However, any putative organism would have to deal with low pH, desiccation and high UV irradiation. At this time, there is no known microorganism on Earth, which can grow under these combined conditions. Nevertheless, putative Venusian microbes could have evolved the needed adaptations if the climate change occurred slowly and so there is still a chance that life could be present in Venus today. Ultra-cool dwarfs are thought to be very common in our neighborhood and to host many planetary systems. As is the case for TRAPPIST-1, we expect that ultra-cool dwarfs can host a suite of small rocky planets. One major difference between ultra-cool dwarfs (UCD; Teff<~ 3000 K) and Sun like stars is that they cool down to settle on the main sequence after about 1 Gyr. Their habitable zones (HZ) thus sweeps inward at least during the first Gyr of their lives. Assuming they possess water, planets found in the HZ of UCDs have experienced a runaway greenhouse phase too hot for liquid water prior to enter the HZ. It has been proposed that such planets are desiccated by this hot early phase and enter the HZ as dry worlds. The author presents results of the modeling of the water loss during this pre-HZ hot phase taking into account recent upper limits on the XUV emission of UCDs and using 1D radiation-hydrodynamic simulations. Applying this model to Proxima-b in and to the planets of TRAPPIST-1 he finds that there is a possibility that Proxima-b and the outer planets of TRAPPIST-1 to have retained a part of their potential initial water reservoir. However, the model shows that TRAPPIST-1 b and c are likely dry. Some configurations exist for which Proxima-b, TRAPPIST-1 e, f and g can harbour surface liquid water, while TRAPPIST-1 h seems too cold to sustain liquid water. Bolmont, E., Selsis, F., Owen, J. E., Ribas, I., Raymond, S. N., Leconte, J., Gillon, M.: Water loss from terrestrial planets orbiting ultracool dwarfs: implications for the planets of TRAPPIST-1, Monthly Notices of the Royal Astronomical Society, Vol. 464, pp. 3728-3741, 2017. Proxima b is a planet with a minimum mass of 1.3 M⊕ orbiting within the habitable zone (HZ) of Proxima Centauri, a very low mass, active star and the Sun’s closest neighbour. The analysis of data from multiple facilities shows that the top of atmosphere average XUV irradiance on Proxima b is 0.293 W m−2, that is, nearly 60 times higher than Earth, and that the total irradiance is 877±44 W m−2, or 64±3% of the solar constant but with a significantly redder spectrum. Despite the high level of stellar activity, Proxima b is likely to have lost 0.5-2 Earth ocean’s worth of hydrogen (EOH), depending on the assumptions, before it reached the HZ 90-200 Myr after its formation. Proxima b is a viable candidate habitable planet. Within a decade, it will be possible, with the ELT for example, to image Proxima b and possibly determine whether this exoplanet’s surface is habitable.